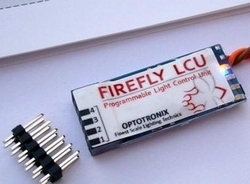 The new controller electronics FireFly LCU offers numerous features for a samll price. With dimensions of only 16 x 40mm (0.63 x 1.57in) and a weight of just 9g (0.32oz) the entry level module offers the following features already known from the Aurora LCU (item no. OPT2000). 4 programmable outputs with output power of up to 1.4A each. With only 9g (0.32oz) the FireFly LCU is really lightweight. Due to the power supply via receiver the R/C lighting can be realized with very low weight. An easy to use pushbutton as well as 5 status LEDs ensure fast and direct operating. Activation point and function can be programmed for each output easily with one keystroke. Furthermore the FireFly LCU matches with the used transmitter. So programming effort will be reduced. Also the entry level lighting module offers numerous flashing sequences. For each output the desired starting point of flashing can be selected in three steps separately. 6 different flashing sequences, three different starting points selectable. 1 beacon effect (for simulating rotating beacon on small sized models). On keypress standalone mode can be selected - the chosen outputs stay aktive even without receiver signal. Perfectly suitable for fairs. On keypress the charging status of the battery can be requested in six steps. On critical battery voltage an alert is given and FireFly LCU stops operating. If battery is not separated from the electronic module operation will be interrupted automatically. a plugbar with coldplated contacts which simplifies soldering of the lighting as well as Aurora Carrier (item no OPT2020) for convenient installation inside the model.